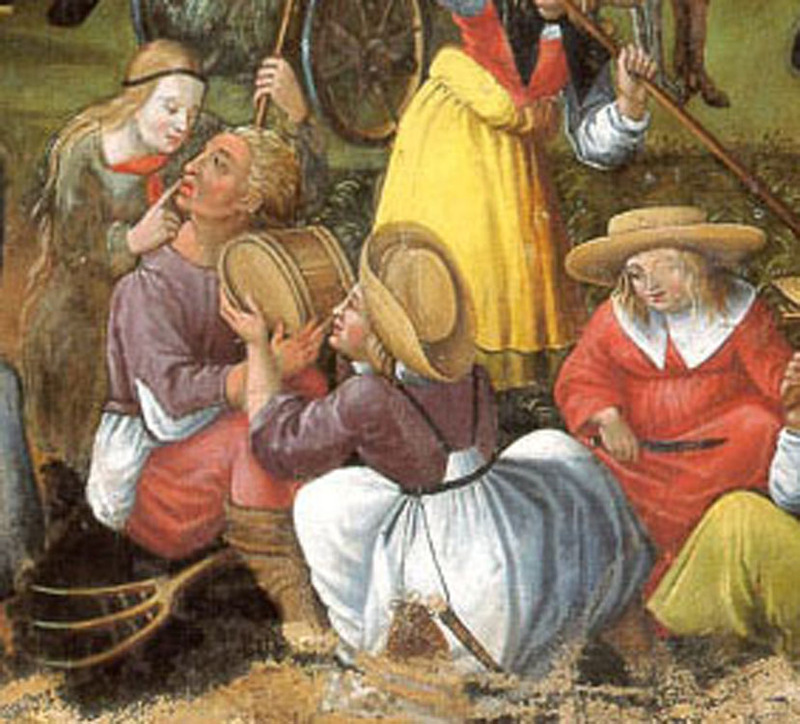 This dress is a peasant dress shown in the Augsberg paintings. 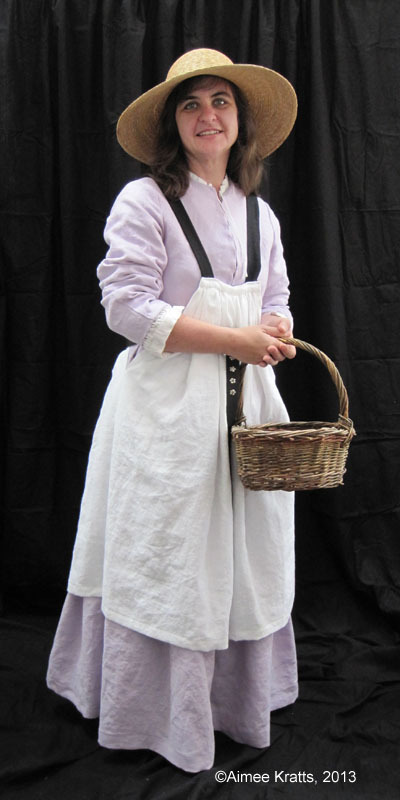 I wanted to make this dress to show that if you dress like a peasant, you can wear a straw hat and unbound hair and still be historically accurate. This is a good option for people who want to wear German garb without having to wear a wulst (the big, round, dounut-shaped headgear). This dress is also a good example that peasants could and did wear purple. When you compare images you will notice that the black straps are shorter in my reproduction. This is because I have worn a double apron before and the straps tend to fall off one’s shoulders fairly easily. For Esperanza’s dress, I have experimented with shorter straps. If they stay on her shoulders, I’ll make some longer straps. One note about the double apron, it is heavy weight linen. If you make it from light-weight linen, it will be too “floaty” and won’t hang right. Also, there is almost as much fabric (width-wise) in the apron as there is in the skirt. The last double apron that I made was much narrower than the skirt. The effect was that the movement of the dress was constricted. So, I recommend that if you want to make a double apron that doesn’t impede your movement, make it almost as wide as your skirt. A useful piece of information is that the final gathered width where the straps are attached to the apron is six inches wide. Someone has already asked if the original dress was made in wool. I’m fairly certain it was. However, Slippery Rock, PA is much hotter than Germany and the Baroness wants to wear the dress at Pennsic, so the dress is make of lightweight linen. The bodice is lined with heavier weight linen. In addition, I made a petticoat out of the same purple linen. I love this so much!!!! Wonderful!